The Hammer Black Widow bowling balls keep rolling out and taking over the lanes. The Hammer Black Widow Gold takes Hammer's most angular coverstock, the Semtex Pearl, and pairs it with their most angular core, the Gas Mask, to create a ball that goes long and then offers a ton of backend motion when facing medium to heavy oil. This bowling ball is Carbon Fiber Infused! Carbon fiber is one of the toughest materials on earth. Hammer decided to add this material to the inner core of this ball for added strength and durability allowing them to offer an incredible 3 year warranty. For this ball I used a 65 x 5 x 40 layout which put the pin above the bridge. For me this ball gives me easy length and a strong, controlled back end motion. I really liked this ball on our house shot, it gave me a consistent angular motion. If you are a fan of the black widow series, this is a must own! The Black Widow Gold reminds me of the old Black Widow Legend Pearl. It has a good roll through the mids, and is responsive at the break point. The pearl coverstock matches up to a variety of patterns, but is great during transition on house patterns. Likes: This ball is the perfect compliment to the entire Dark Legend line. It get downlane where the previous 2 ball in the current lineup want to pick up and the gold still has awesome corner ability and still sends messengers like crazy. I love the Semtex Pearl coverstock on my Phobia, so when I heard that the same cover is on the famous Gas Mask core of the Black Widow, very excited to hear this. The coverstock helps get the ball really clean through the fronts and offer a BIG backend motion that Hammerhead fans like to see. I see this cover a little stronger than advertised for a pearl ball and handles the heavier medium patterns with ease. This ball is definitely a great ball for the typical house patterns as you can keep moving left (right handed) and the ball will not quit on you. 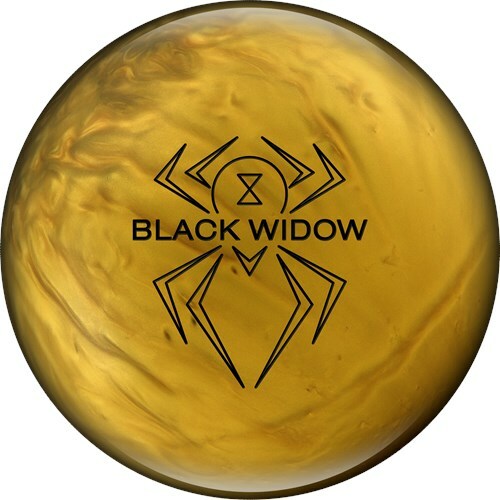 Black Widow GOLD really shines when you need to get inside the pattern and need a ball to turn the corner in the backends for various medium to medium-heavier lane patterns. It will allow various styles of bowlers be able to start straighter and chase the oil if needed. For me, BW GOLD is about 4 boards stronger overall & more angullar than the Phobia, which is another great ball from Hammer. I really like what I see in this new release from Hammer and I think this ball will be a must have ball for those that are looking for something that offers a great motion to have an angular asymmetrical rolling ball in your bag. - it really continues through the pin deck! Very versatile ball… You will be impressed! With the standard 3 year warrantee that Hammer provides for their balls, this is another added value for your money! The successful and proven core (gas mask) says it all. This ball provides good length through the front part of the lane with a strong continuous backend (angular)!!!! Hammer has provided the costumer with its most angular core and coverstock all in one. Get your Black Widow Gold ASAP. You’re not going to want to miss this one!! Likes:love the Classic Gas Mask Core, now wrapped with the Semtex Pearl, Carbon Fiber Infused quickly made this my favorite ball. Hammer put the most angular cover on their most angular core creating a backend MONSTER!! Dislikes:I don't like the color, but the results have been golden! Likes: This ball gave me great shape the deeper I moved. I was able to continue to use this ball as I transitioned left, without losing reaction and hitting power, as I often do (lower rev player). I found that the gas mask core gave it that traditional black widow shape, and the cover allowed it to gain early traction, even with the out of the box polish. Dislikes: Too violent of a reaction for a fresh pattern. What did we think of the Black Widow Gold. Stand left, throw right. It seems like that’s what a lot of bowlers want to do these days. Hammer delivered that. And while I’m not typically a fan of skid/flip reaction due to the inconsistency, the Gold really offers a surprisingly consistent motion. It’s strong off the spot and seems to have a consistent reliable motion. When you can get this strong a motion down lane with the reliability of a benchmark, you have a gem. I’m comfortable saying Hammer gave us a gem with the Black Widow Gold. Page created in 0.657 seconds with 22 queries.